A couple of Fridays ago, The Jolly Runner and I were very honoured to be invited to a colleague's wedding in Juhu, Mumbai. Not only was this a visually beautiful occasion - but with the many rituals and traditions associated with an Indian wedding, it was also fascinating. Indian nuptials usually go on for several days and involve - at a minimum - several hundred guests. The biggest weddings have several thousand guests (and we complained about having to entertain a 100 people at ours!) and from what I can tell from driving past the many wedding venues in Mumbai - can involve a limitless budget. The ceremonies and receptions require huge amounts of space (a cricket pitch will just about suffice), furniture, lighting, food, music and drum bands, flowers, fireworks and special platforms for the bride and groom. When I think about the headache of organising a rather sober English wedding, I can not imagine what Indian families must go through to get theirs sorted out. All I can say is I bet there must be some very profitable wedding planning businesses in this city! These gold hanging ornaments dangling from the bride's wrists are known as Kalira. Kalira symbolise warm wishes and blessings and she will wear them until the ceremony is concluded. Once the kaliras are tied, the bride shakes them on the heads of the unmarried friends or girls of the family. According to an old adage, if part of a kalira falls on one of the girls, she will be next in line to be married. Just like the throwing of flowers by the bride in a western ceremony! Above and below: traditional Mehndi (henna tattoos) on hands and feet. Mehndi ceremonies can take place a the bride's home before the wedding - sort of like a hen do! The attention that is paid to the groom at an Indian Wedding would leave English guys breathless. Instead of being holed up downing a pint at the bar just before an ordinary English wedding ceremony, the men (usually if they hail from a North Indian state) will arrive on a decorated horse wearing equally elaborate clothing and headwear - whilst his friends and family dance to drums and music around him all the way down to the street leading to the wedding venue. This is called a Baarat and signifies the bonding together of the two families. Whilst the Baarat is happening, the bride must quietly await his pending arrival. Unfortunately we missed this ritual as we were too busy staring at the bride! After the groom has arrived from his Baarat, the close female friends and relatives of the bride accompany her to the wedding dais under a canopy. Everyone is wearing such gorgeous colourful clothing. I myself wore a long anarkhali with churidar (style similar to the dark blue dress to the left of this picture). Other friends wore pretty saris. The wedding ceremony itself is very detailed and will differ according to state and family traditions. The wedding we attended followed mostly Punjabi traditions. The most important element is probably the Saptapadi, which is the taking of seven circuits around the Holy Fire whilst exchanging vows with every step - the fire being witness to the vows being made by the bride and groom. If they take the seven steps together they are sure to remain lifelong friends. How nice is that! Jai Mala is another step in the ceremony where the bride and groom place garlands over each other's heads. This indicates the desire and acceptance to be united in matrimony. There were many more parts to the lengthy wedding ceremony which proceeded whilst the rest of us were digging into the lovely buffet and chatting amongst ourselves in the background. At the end of the ceremony, everyone went up for group photographs with the bride and groom and this is when we handed over our presents. As guests we were treated with great kindness by the parents of both the bride and groom and made to feel very comfortable - truly an honour to witness the joining together of two very beautiful people. May you have many happy years together Neha and Dishank! The wedding dais prior to the ceremony. A glimpse of the outdoor set up. Dressed tables and chairs and lights in the trees....stunning! One of the many food stations at the venue. Delicious! Fabulous post! The outfits are just stunningly beautiful. Great to read about different traditions. 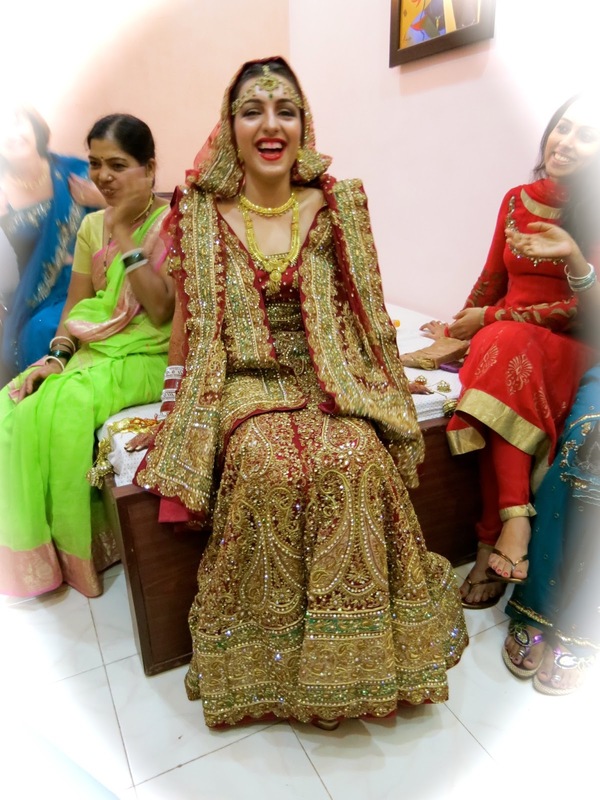 Lovely clothes and ceremonies and makeup and jewelry for the bride. What rich and heavy costume she wears, and it looks like it is true to centuries ago. You were blessed to attend. Awesome!! Bride looks sooo gorgeous in her attire and jewels. Beautiful details. Congrats to the couple. Nice post.